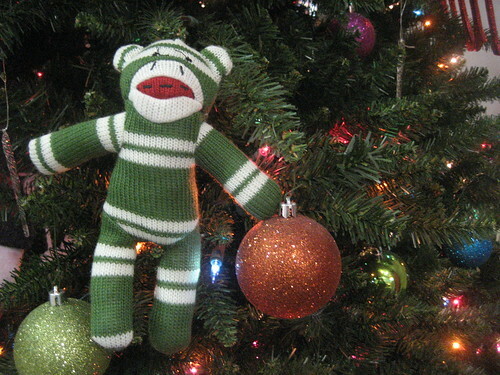 Holiday greetings from me and my Christmas sock monkey! He was an impulse buy at Rite Aid; I saw him on my way to grab the cotton rounds I’d come to buy with my $2 gift certificate that was expiring on Christmas Day and once I picked him up, it was all over—he was coming home with me. We’ve already been having adventures together, like here where he’s invaded someone else’s Christmas tree. On this date in 2009: Post-Holiday Slump, in which I shared a baby picture rather than wallow in my bummed out-edness. 2008: Shhhh, in which I enjoyed a quiet day at work. 2007: There and Back Again, which is a holiday trip report. 2006: Not Quite Matchy Matchy, in which I shared my outfit of the day, and Red Scarf Three, which I’m sure you can figure out without me adding an explanation here. 2005: Wait ’til Next Year, in which the Minnesota Vikings failed to make the playoffs. At least they were in it ’til that point. 2004: Alaska Quilt, in which I revealed a gift I’d made. 2003: I’m Dreaming of a Quilty New Year, in which I went fabric shopping. 2002: The Secret Revealed, which, despite its teasing title, is just a vacation trip report.